Some teachers avoid theory in guitar lessons in favour of giving students something they like. No note-reading or rhythmic notation unless the student is interested in doing that. I get it. Make sure you give them what they want so that they enjoy themselves, have a positive experience, and keep coming back. But this can go too far, and it’s not necessary to eliminate all vestiges of theory. This strikes me as an unreasonable fear of losing students. I take the following approach with beginners. At the beginning of guitar lessons, I do what the teachers I mention above do: give them only what they want, and help them make sounds that they like. Students need to be motivated, and guitar is hard enough without being made to learn notation right at the beginning. It’s ok if the first six months are nothing but song after song, slowly adding more challenges. But once they get to a certain level, rhythmic notation can be introduced without fear. I find that, in general, students like to have some technical know-how. Rhythmic notation is relatively easy to learn, and it provides vocabulary for discussing more interesting rhythmic topics. Notes can wait; rhythm doesn’t need to. Besides, it can be enjoyable. During guitar lessons, have the student clap at an even tempo that is comfortable for them. Then find that tempo on a metronome, and have them clap to the metronome. Tell them that you’re going to write down the rhythm that they’re playing, then do so. Make sure that they keep playing as you do this. This provides instant visual feedback for what they’re doing, and connects their bodily movement with the parts of the brain that process symbols. Now have them clap twice as fast; keep the metronome on quarter notes. This gives them the sound of notes between quarter notes. Make sure they’re clapping evenly. If necessary, have the metronome play the eighth notes, or clap along with the student to model the correct placement. As they’re clapping, write down eighth notes, and give them vocabulary for what they’re doing as you did with quarter notes. Change tempos so that they can get a feeling, both physically and emotionally, for what that is like. 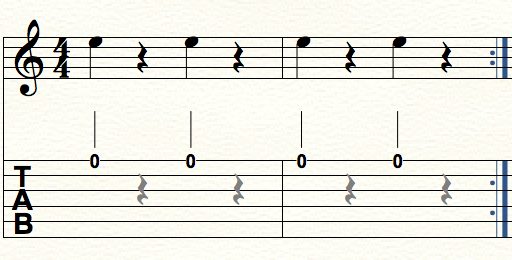 Once they can clap eighth notes in a few different tempos, place quarter rests in the flow of notes on the page. Do this gradually. They should be able to play a rhythmic figure with a single quarter-note rest in a single bar. Have them loop the bar until they can do it easily. Do it in different tempos. Now play that same rhythm on the guitar. So now you’ve covered quarter notes, eighth notes, and quarter rests. They will now have a solid physical and cognitive understanding of these concepts. The key is to have them clapping or playing at all times during the process of learning. You’ve also given them some independence, since they’re now able to pick up guitar books, and understand what’s going on. This is the aim of guitar lessons – give the student the means to learn for themselves. As a teacher, you must be able to break down even the most seemingly easy exercises. One of the easiest things to do on the guitar is to play the open high E string with a pick. Only your picking hand is involved, and you only need to play one string. But problems can emerge and the teacher needs to be prepared for them. Simply finding the string with the pick can be difficult. This is a basic spatial problem. For anyone who hasn’t picked up a guitar before, this can be difficult. If the student has difficulty with this, have them look at the string, place the pick on the string, and then play the string. Once you have played the string, bring the pick back to the string and briefly rest there. Then play. Repeat until this is easy. Then do the same thing with eyes closed. That will fix the problem. Do this with all the strings. The next step is to move from string to string. Begin by using adjacent strings – E and B; B and G; G and D; D and A; A and E – and simply play one and then the other. Make sure to rest briefly on each string before playing it. For beginners, the 8th fret is a good place to start since it’s easier to press the string into the fretboard than at the 1st fret. Most teachers start in first position, and then move up the fingerboard after that. Reversing this makes the process less frustrating. Have the student press the string at fret 8 at the front, middle, and back of the fret, and play each time, making sure that their finger is in the proper curved position, looking as though it’s holding a grapefruit. Which place on the fret is easiest to press down? Which sounds best? Get them to do this with each finger. Once they can do this, get them to move from one fretted note to another, using different fingers. For instance, play the 8th fret with the index finger, and then play the 9th fret with the middle finger. Continue with the ring finger at the 10th fret and the pinky at the 11th fret. 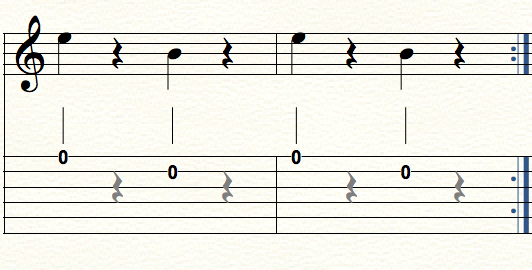 Play from the open E string to the note at fret 5. Play the E string, rest for a beat, press fret, play fretted note. Repeat until it sounds smooth. Once mastered, play alternating half notes. For example, alternate the E string with fretting the 5th fret. 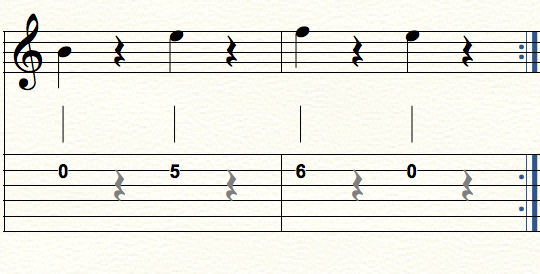 This requires more coordination; the student has to time the pick-stroke with each note. This is especially difficult when fretting; the pick has to meet the string just as the finger presses the note down. The slower you do this, the easier you can hear when it doesn’t work. When half notes are mastered, move on to alternating quarter notes. Now introduce a simple, one-string melody. Now get them to play a melody between adjacent strings. The point of all this is to demonstrate how to break down something that seems to need very little explanation. Most skills developed on the guitar benefit from this type of scrutiny.